A detailed explanation of various platform mechanics, and how they create platform techs. The video demonstrates various collision box quirks that are normally unseen in general gameplay. The latest video from Kadano's Youtube series Melee Mechanics. 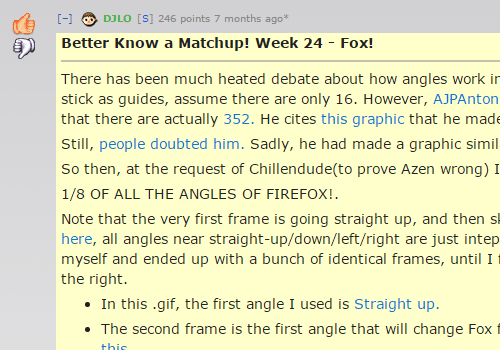 Kadano produces incredibly high quality videos detailing the inner mechanics of melee. Each video covers a few topics, and start with core mechanics for the rest of the video to build upon and help piece together. The latest video of the SSBM Tutorials Youtube series. Kira and Kellen produce high quality tutorials for various techniques, ranging from moonwalks to full on neutral games. Kira is a top player with a tremendous amount of knowledge, and Kellen makes sure his ideas are understood in the video. A massive collection of character specific gifs+gfys for every character, detailing crucial tech and attributes. Each gif packaged with a discussion thread. A huge and detailed chart of all characters ground movement options and their respective velocities. This is used to compare movement options of one's character, or to compare between characters. 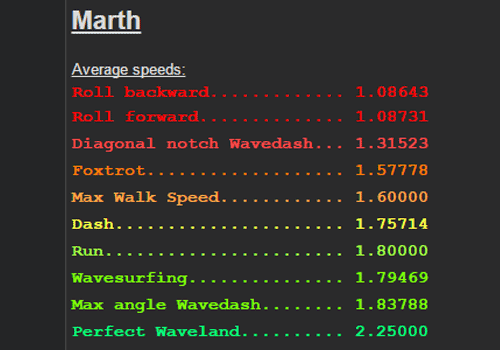 All the data was created using reverse engineered algorithms of melee's real mechanics and programmed into python. The python code can be found on the site.